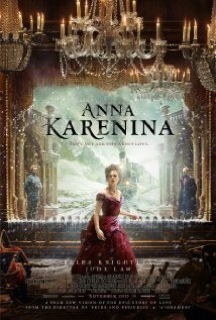 Review: This new cinematographic version of “Anna Karenina”, the 1877’s novel immortalized by Leo Tolstoy, was adapted by Tom Stoppard and directed by Joe Wright. Just as in his former period movies, “Atonement” and “Pride & Prejudice”, Wright picked up Keira Knightley as star. Playing Karenina’s role in a charming way, she was almost alone in a cast that didn’t impress. The movie starts with a comical posture, somewhat frivolous, and soon goes through a theatrical approach that wasn't favorable. Frequently insipid, its most lively moment was a horse race. As for the remaining time, the movie spread melancholy through the waving hand fans and occasional sighs coming from the ballrooms. Notwithstanding the confident attitude and haughty pose adopted, “Anna Karenina” kept a distance and failed to get me out from a state of numbness.